Digital Diamonds returns with the latest edition of their flagship compilation series, Digital Family Vol. 4. Label boss Alic has selected a great mixture of peak-time tracks, relaxed groovers, and experimental oddities for release number thirty. Hear the freshest music from new artists and veteran members of the “Digital Family”, who always guarantee an experience of the peculiar. Time to come aboard! Mastering and cover artwork by Sonic. MP3 Download | FLAC Download | WAV Download · Download count: 23,110. Ah, Frechbax – ever a treat! Thanks so much. As always, Digital Diamonds delivers big!!! The Alic Remix of “Vasya Exhale” is fantastic. This music is a reflection of my mind. 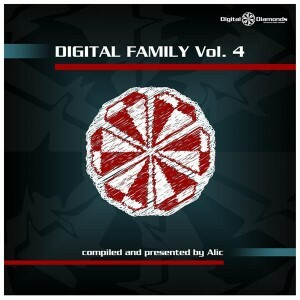 All vol “digital family” are the best. Google this translator writes so poorly translated as something I’m sorry for him. I’ve been waiting for vol 5!! Great tracks….especially tracks 2,6,7,8….nice club tracks. fantastic compilation!! got me hooked from the 1st track ! deep and vivid. Great tracks, love the Aerodrome track.